Alwin Jurtschitsch from Weingut Jurtschitsch in Austria was in town (Washington DC). He came with Johannes Hasselbach, Weingut Gunderloch, Germany and Max von Kunow, Weingut von Hoevel, Germany, to (1) present Weingut Jurtschitsch and his wines to a small group of sommeliers and wine writers over lunch and (2) to present with Johannes and Max their Wurzelwerk project. The lunch took place at BToo, the up and coming restaurant of Bart. Both events were organized by Rudi Wiest Selections and Annette Schiller, ombiasy PR and WineTours. Weingut Jurtschitsch in the Kamptal town of Langenlois is one of Austria's oldest wineries. Dating back more than 700 years, the winery was originally operated by the nearby Franciscan monastery. The Jurtschitsch family purchased the estate in 1868, and it has been run by family members ever since. Until Alwin and Stefanie took over, the three brothers Edwin, Paul and Karl Jurtschitsch were in charge. Edwin tended the vineyards, Paul oversaw winemaking (along with oenologist Steffen Roll) and Karl directed sales and marketing. 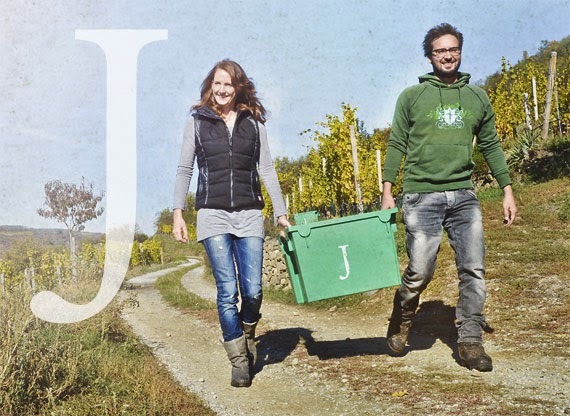 David Bowler (US importer for Weingut Jurtschitsch): Over the past generation, the Jurtschitsch winery in Langenlois / Kamptal has grown into one of the most prominent top wineries in Austria. Having being run by the three brothers Edwin, Paul and Karl Jurtschitsch, the family-owned winery has now been passed on to the younger generation, to Alwin Jurtschitsch and his partner Stefanie Hasselbach. Alwin Jurtschitsch: Grüner Veltliner Loiserberg is our highest and coolest vineyard site. The cold winds from the northwest chill down this hill as soon the sun goes down and so the fine fruit aromas in the berries are preserved. The combination of microclimate and soil creates a wine with a crystalline structure and pure fruit. The grapes are harvested according to taste – not by analysis. It is only a short time between not yet ripe and over ripe maturity. If the grapes are too ripe, you lose minerality. 100% spontaneous fermentation in 2000 liter barrels (local oak, old barrels). 6 months on full lees before bottling. All single vineyard wines are 100% botrytis free. Alwin Jurtschitsch: Heiligenstein means “holy stone” and is one of the most historical single vineyards of the Kamptal. The soil type is unique and only found on this special hill. It was formed during the period of Perm, 270 billion years ago. A very high content of Quartz leads to intensely mineral wines. Heiligenstein is mostly planted with Riesling. A special flora and fauna is found in this natural reserve. During the day the hillside is influenced by the warm pannonian climate form the south and at night the cool temeratures from the highlands chill down the area. This big change in temperature between the night and day leads to the unique fruity Riesling style. Riesling of Heiligenstein is normally fermented very dry. The high acidity levels in 2010 are well balanced with about 7 gram of residual sugar. 60 year-old vines are planted on steep, desert sandstone terraces. The wines are macerated for 12 hours and fermentation starts spontaneously in 1100 liter barrels. The wines spent 6 months on the lees and batonnage is done. Todd M. Godbout (Wine Compass Blog): We started the lunch with the Jurtschitsch Grüner Veltliner Loiserberg 2012 Kamptal DAC Reserve, Erste Lage and 2011 Zobinger Heiligenstein Kamptal Reserve Riesling, with Alwin introducing us to their 150 year old winery. The winery itself includes a 700 year old cellar and is located in the Kamptal DAC, northwest of Vienna and west of. The steep hills of Heiligenstein ("holy rock") contain a unique blend of desert sandstone and volcanic soil which adds a salty minerality to the Riesling - a perfect match with our oysters appetizer. The Riesling also possessed a green apple flavor with plenty of acidity accumulated from the cool nights. The Grüner Veltliner has a more floral aroma, with a silky texture after being fermented in neutral oak and spending 10 months on its lees. These are two delicious wines.